August is shaping up to be American music month in Shanghai. Metallica, the legendary heavy metal band, has just wrapped up its long-awaited China debut with two packed shows at the city's Mercedes-Benz Arena. This weekend, Limp Bizkit headlines a two-day festival. Next week, Aerosmith plays a Shanghai soccer stadium followed by a concert by Pitbull, the Cuban-American rapper from Miami. Song Yang, a bass player in a Chinese metal band called Spring and Autumn, flew in from Beijing to see the first Metallica show, which sold out in just six minutes. "For me and my comrades-in-arms who play rock music, Metallica was the band that enlightened us," says Song, 34, whose band is one of many in Beijing's thriving metal scene. "They were the first foreign rock band we listened to." Song says the Metallica's rebellious music first spoke to him when he was a high school student in the late 1990s. "I was in a classroom using a Walkman, listening to a cassette tape, while the teacher was teaching," Song says, standing in front of the Mercedes-Benz Arena, which looks like a flying saucer and changes colors. "Being able to see them perform onstage has been one of my dreams since I was young." Metallica played for about two hours on a bare black stage backed by risers and giant video screens. For cultural reasons, Chinese audiences are generally much more subdued at concerts than U.S. audiences, but the Metallica crowd was an exception. As the band tore through hits such as "Enter Sandman," thousands on the arena floor sang along, pumping their fists in the air. 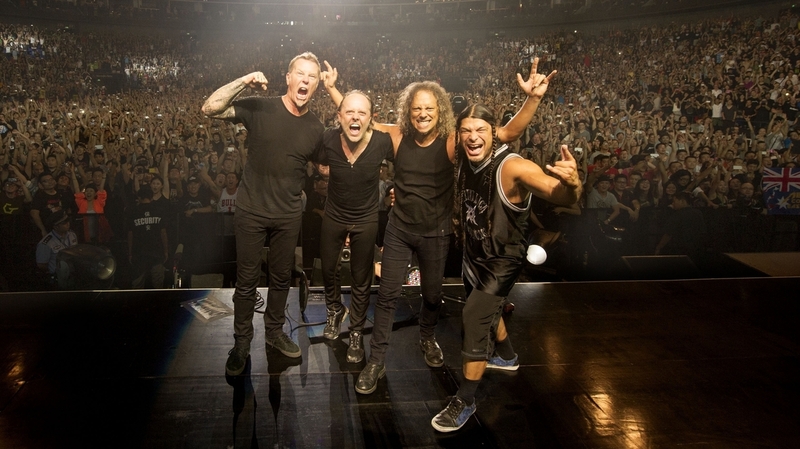 "In this third quarter and fourth quarter, you'll see an unprecedented amount of music coming through Shanghai in international acts," says John Cappo, president and CEO of the Asia division of AEG, the giant entertainment and sports events company that handled the Metallica shows. Adam Wilkes, a senior vice president with AEG Live, says more talent is coming to China because of better venues and Chinese fans who are more familiar with Western music through the Internet. Not long ago, Wilkes says, potential venues for big shows included decrepit government gyms and arenas still under construction. "There was no roof on the building, and the floor was mud," he recalls about one site visit. "They were convinced that somehow, three months later, the building would be ready for a show." Today, AEG manages the Mercedes-Benz Arena, which seats about 10,000 for a concert and rivals any similar venue in the U.S. But just because more acts are coming to Shanghai doesn't mean everyone is making lots of money. Michael Luevano, who managed The Rolling Stones' show in 2005, says production costs in Shanghai are huge, and some revenue streams that work in the U.S. don't work there. "Generally, the artist will keep the revenue from the merchandising, but the reality is that means they have to bring in the merchandising, which is very difficult," says Luevano. "It's too expensive to bring in thousands of Metallica shirts." Customs fees and shipping costs just aren't worth it. When official merchandise does arrive, it has to compete with knockoffs sold within the arena grounds. Take Tuesday night's show. To get to the upper-level seats, ticket holders had to run a gantlet of hawkers selling bootleg Metallica hand fans, buttons and black T-shirts. The knockoff T-shirts cost $8 each, compared with the genuine article sold inside the arena for $32. Just before showtime, police arrived with whistles and pushed the vendors outside the fence, but the effort was halfhearted and the hawkers merely saw it as a minor annoyance. One even kept trying to sell a hand fan for 75 cents as a cop stood over her. In 2000 Metallica famously sued Napster, the peer-to-peer file-sharing network, for copyright infringement. But at a press conference yesterday, drummer Lars Ulrich was diplomatic. "The one thing increasingly that we focus our energies is to try to discern between what we can control and what we can't control," Ulrich said. "It is what it is, and that's a whole separate conversation about Chinese copyright issues and so on, which maybe is not the time to do now. But you can't control that." Wednesday night's show wrapped up a bit after 10:30 p.m. Afterward, Kevin Zhou, a businessman from the central Chinese city of Nanjing, plunked down $32 for an official Metallica T-shirt. Zhou, 30, found the two hours of headbanging cathartic. "I'm satisfied. Very satisfied," Zhou says, deflating a giant, black Metallica beach ball that the audience had been batting around the arena floor. "Everyone will encounter all kinds of troubles. I feel when I listen to their music, my troubles just go away."